The Air Group that would come to be known as Carrier Air Wing Seventeen, Carrier Air Group Eighty Two, was created during World War II on 1 Apr 1944, in Atlantic City. Air Group 82 deployed for one of the last combat tours of the war aboard USS Bennington (CV 20) as the first air group to operate from her decks. The air group operated in the Pacific for the remainder of the war supporting the assault on Iwo Jima and the Japanese home islands. During the battle for Okinawa, the Air Group was the first to attack the Japanese super battleship Yamato that resulted in the ship sinking. Following the war, the air group was re-designated Carrier Air Group Seventeen (CVAG-17) and redeployed to the East Coast in 1946. Until the Air Group was deactivated in Sept 1958, Air Group 17 operated with the Atlantic Fleet and deployed to the Mediterranean and North Atlantic onboard USS Franklin D. Roosevelt, USS Wasp and USS Coral Sea. Air Group 17 was reactivated in Nov 1966, as Air Wing 17 (CVW-17) and assigned to the USS Forrestal (CV-59). Just six and a half months after re-forming, the air wing deployed to the Tonkin Gulf aboard Forrestal. CVW-17 flew its first combat missions into Vietnam on 25 Jul 1967. On the fifth day of combat operations, a Zuni rocket was accidentally fired across the Forrestal’s flight deck resulting in a catastrophic fire. Herculean efforts eventually controlled the flames, but not before 134 men were killed (including 112 Air Wing personnel) and 21 aircraft were destroyed. Throughout the next 15 years the Forrestal/CVW-17 team remained intact, conducting 10 Mediterranean deployments. The Air Wing headquarters moved from NAS Oceana, VA, to NAS Cecil Field, FL, in 1980. When the Forrestal entered a Three-year Service Life Extension Program (SLEP) in Nov 1982, CVW-17 crossdecked to the USS Saratoga (CV-60). The ’85 to ’86 Med Cruise found the Saratoga/CVW-17 team in the thick of the action, intercepting the Egyptian airliner containing the Achille Lauro hijackers on 10 Oct 1985, and conducting strikes against Libya in Mar 1986. Following lraq’s invasion of Kuwait in August 1990, CVW-17 and Saratoga were immediately dispatched from a Med deployment to the Red Sea. During Operation Desert Shield, CVW 17 and Saratoga maintained sea control in the Red Sea while preparing for combat. 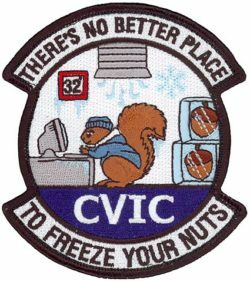 CVW-17 launched its first combat strike into Iraq at 3 a.m. on 17 Jan 1991 and continued to strike targets almost continuously over the next 43 days during Operation Desert Storm. CVW-17 aircraft delivered over four million pounds of ordnance during Desert Storm, returning home on 28 Mar 1991. In Nov 1992, CVW-17 and Saratoga completed yet another record setting deployment to the Mediterranean, logging over 22,500 flight hours and over 9,500 arrested landings. CVW-17 and Saratoga were the first Carrier Battle Group to take station in the Adriatic Sea off the coast of Yugoslavia in support of Operation Provide Promise. In addition to supporting United Nations Forces, CVW-17 participated in NATO and other exercises with 11 littoral Mediterranean countries. In Jun 1994, CVW-17 was transferred to USS Enterprise (CVN-65) homeported in Norfolk, VA. In Sep 1994, CVW-17 moved its headquarters back to NAS Oceana, VA. Upon completing a successful 1996 deployment on Enterprise, CVW-17 was transferred to USS Eisenhower (CVN-69), also homeported in Norfolk, VA. In the summer of 1998, CVW-17 and the Eisenhower patrolled the Adriatic Sea in an effort to keep the peace in Yugoslavia. Following the 1998 Mediterranean cruise, CVW-17 was transferred to USS George Washington (CVN-73), homeported in Norfolk, VA. During “Team 90s” (CVN-73 + CVW-17) combat deployment to the Mediterranean and Indian Ocean in 2000, CVW-17 broke numerous operational and positive safety records flying over 9,300 sorties, 18,000 flight hours and logging over 9,200 arrested landings. As a result of a banner deployment and unmatched operational excellence and teamwork, the CVW-17/ CVN-73 team garnered 52 awards in 2000, including six Battle “E”s, four Safety “S”s, the RADM McCluskey and RADM Clifton awards, and the first ever RADM Ramage award for operational excellence. CVW-17 deployed again with the George Washington Battle Group in Jun 2002, to the North Arabian Sea off the coast of Pakistan. In support of Operation Enduring Freedom, CVW-17 aircraft conducted strikes against the Taliban and al Qaeda in Afghanistan. After returning from the six-month deployment on the George Washington, CVW-17 was reassigned to the USS John F. Kennedy, homeported in Mayport, FL. Air Wing 17 deployed on the “Big John” in Jun 2004, for what would be a six-and-a-half month deployment to the Persian Gulf in support of Operation Iraqi Freedom. Together, the aircraft of CVW-17 flew 8,296 sorties for a total flight time of 21,824 hours during the 2004 deployment. Of that total, 4,396 sorties and 11,607 flight hours were in direct support of Operation Iraqi Freedom. CVW-17 aircraft dropped over 54,000 pounds of ordnance in support of coalition operations in Iraq. Air Wing aircraft, flying missions more than six hours long from the USS John F. Kennedy, played a key role in supporting coalition ground forces during operations in Fallujah, Iraq in Nov 2004. As coalition forces swept through the city, clearing it of insurgents, CVW 17 joined Air Force and Marine Corps aircraft in striking key positions. The Air Wing returned to NAS Oceana, VA, in Dec 2004. From Apr to May 2006, and April to Oct 2008, CVW-17 completed two deployments in support of Partnerships of the Americas (POA) aboard the USS George Washington (CVN-73). Partnership of the Americas included exercises and operations with Caribbean and Latin American countries, as well as goodwill port visits throughout the region. The U.S. Southern Command (SOUTHCOM)-sponsored deployment was designed to enhance maritime security and strengthen ties with partner nations. In January 2010, CVW-17 provided support for Haiti following a major earthquake that devastated the country. HS-15 provided Humanitarian and Disaster Relief (HADR) from CVN-70 during that operation. From November 2010 to Jun 2011 CVW-17 deployed onboard the USS Carl Vinson (CVN-70) in support of Operation Enduring Freedom, providing over 1000 combat sorties. Shortly following the return from that deployment, CVW-17 was surged to provide another 1000 sorties in support of Operation Enduring Freedom from Nov 2011 to May 2012. The Air Wing is currently attached to Theodore Roosevelt Strike Group (CSG-9) and is based out of NAS Lemoore, CA.